Speed is blinding. 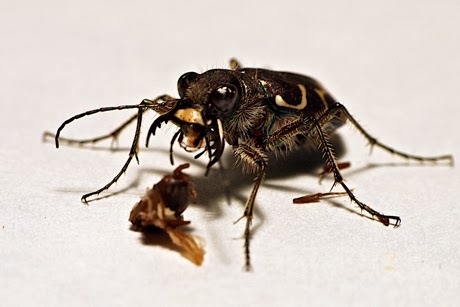 Just ask the tiger beetle, the fastest insect its size. Though predatory tiger beetles have excellent sight, when they chase prey, they run so fast they can no longer see where they are going. Cornell researchers have discovered that, unlike insects that wave their “feelers” around to acquire information, tiger beetles rigidly hold their antennae directly in front of them to mechanically sense their environments and avoid obstacles while running, according to a study published online Feb. 5 in the journal Proceedings of the Royal Society B.